Octavo Systems back in 2017 released their OSD335x-SM System-In-Package device, a powerful ARM Cortex®-A8 SIP-based package. The OSD335x-SM was a device of its class, measured at just 21mm x 21mm, and the OSD335x-SM is the smallest AM335x processor-based module on the market today that still allows complete access to all the AM335x device I/Os including PRUs. The OSD335x-SM helps in removing the need for DDR routing, power sequencing, complex supply chains and even the need for building larger PCBs to accommodate several components. 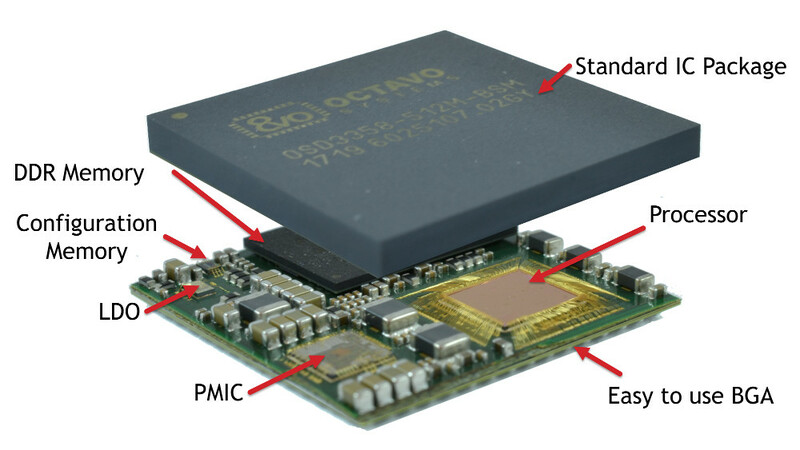 Octavo has announced the availability of the OSD3358-SM-RED platform. The OSD3358-SM-RED platform is the official Reference, Evaluation, and Development platform for the OSD335x-SM SiP family. It is designed by Octavo Systems to allow users to evaluate the OSD335x-SM SiP for their application quickly. The OSD3358-SM-RED is fully designed around the OSD335x-SM SiP at its core, thus inheriting all the features of the SiP device. The OSD335x-SM integrates a powerful 1GHz Texas Instruments Sitara AM335x processor, DDR3 Memory, two power supplies, and passives into a single easy to use package. The 256 Ball BGA is 60% smaller than an equivalent design using discrete devices, making it the smallest ARM Cortex-A8 system implementation. The development board comes included with a Gigabyte Ethernet (10/100/1000 Ethernet), a whopping 5 USB 2.o ports (comes with 4 USB hub ports and 1 micro USB client port), a micro HDMI for display, and two 46 pin expansion headers which makes it compatible with the Beaglebone ecosystem. The OSD3358-SM-RED has a 16GB eMMC on board and a microSD card interface. The board also adds some onboard sensors providing a possible real-world case study. It comes with a 9-axis IMU that provides acceleration, gyroscope, and magnetometer data; a barometer to provide altitude; and a multi-channel temperature sensor. 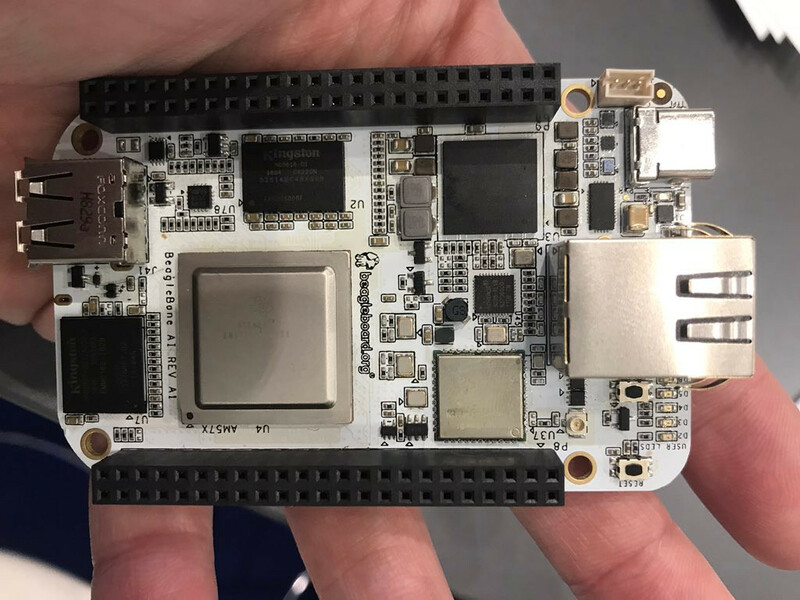 Even though the SM-RED shares some compatibility with the BeagleBone it has no onboard WiFi and Bluetooth, but there’s an Ethernet port, and unlike the BB Black and other BeagleBone variants, it’s a GbE port. You also get 16GB eMMC compared to 4GB on the other BeagleBones. 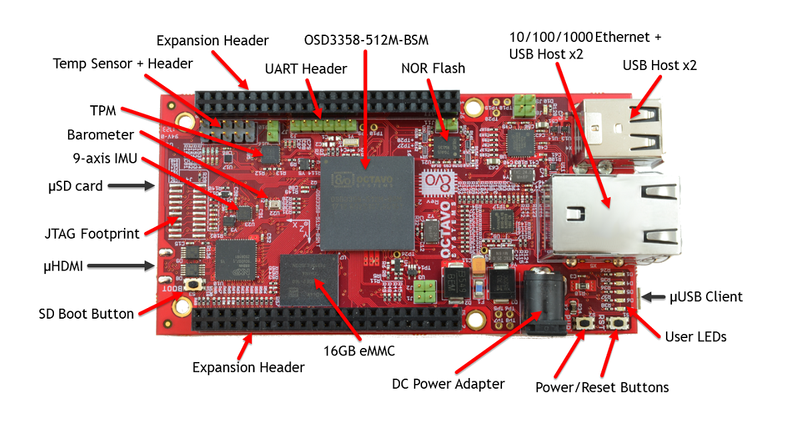 The OSD3358-SM-RED platform comes pre-loaded with a Debian Linux distribution complete with driver libraries for the different sensors on the board. All of the design files are freely available and can be used as a known good starting point for new designs. 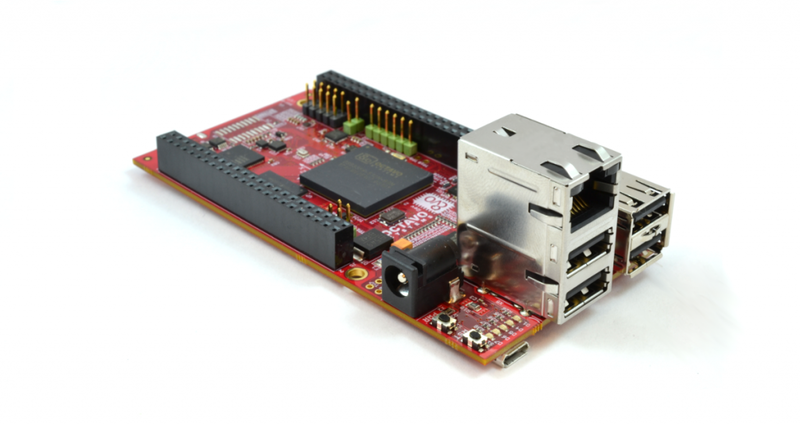 The OSD3358-SM-RED is available from Octavo Systems, Digi-Key, and Mouser for $199. More information may be found on Octavo’s OSD3358-SM-RED product and shopping page.